Pizza is welcome anytime, any day by my kids. But #Monsoon and Pizza: Now thats a delicious combination, dont you think ? I didnt actually need any excuse to bake this, for we have stopped eating pizza from outside home, and the kids were craving for pizza for their weekend Brunch. Although I make pizzas regularly, thin crust is preferred to both Pan Pizza as well as Deep Dish Pizza. Along with some hot Soup or broth, this makes for a rather hearty brunch or supper. I was sent Cheese and Chillies as secret ingredients for a monsoon based theme by Mayuri , who along with Priya Suresh runs this rather interesting group called Shhh Secretly Cooking Challenge! I was new into this group, and the ingredients sounded rather interesting. Cheese is well, delicious and tempting to work with. 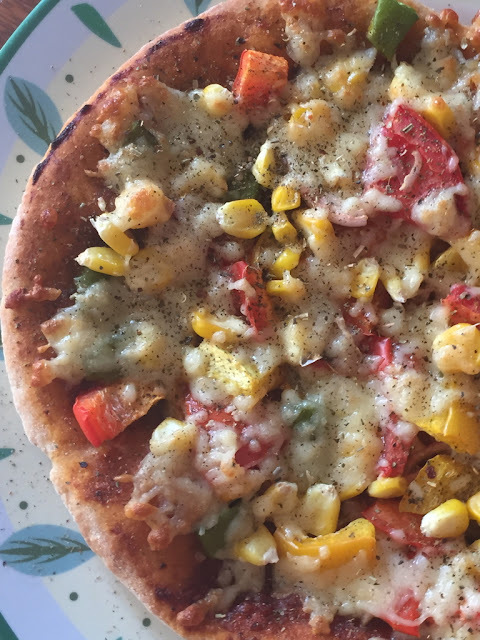 As my little one is young and cant handle the heat with green chillies, I sub the same with red chilli flakes for this pizza. Absolutely any kind of topping can be used, but I was keen to use green peppers, Corn and Cheese for this thin crust pizza. 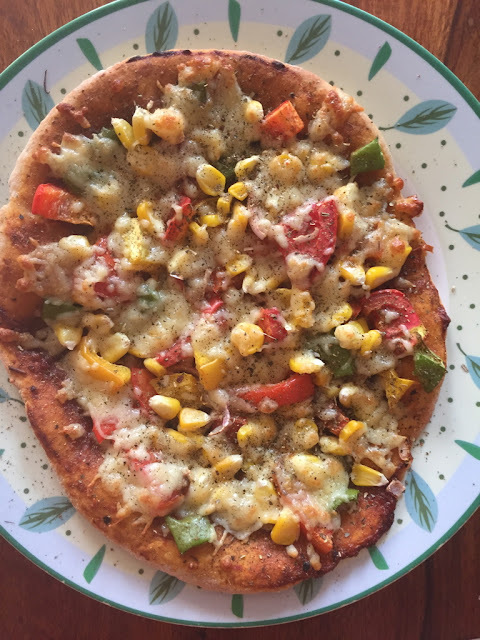 I used the Wholewheat base I had used for the Wholewheat Cheesy Pizza and the results were fabulous. Once the pizza dough has risen, pre heat oven to 200 C.
On a layered baking tray, place the rolled out dough, brush with olive oil. Sprinkle pizza seasoning, crushed black pepper and chilly flakes and serve immediately. Sending this to Shhh Cooking Secretly Challenge as well as my own event+ giveaway - MonsoonMojo2. 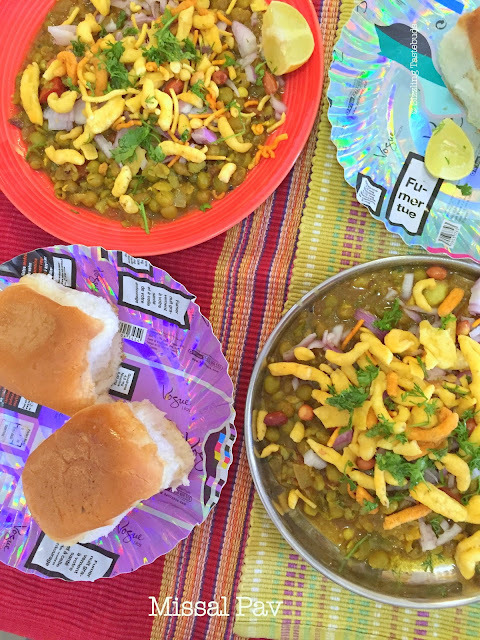 Do link up all your monsoon treats and win a chance for a giveaway ! 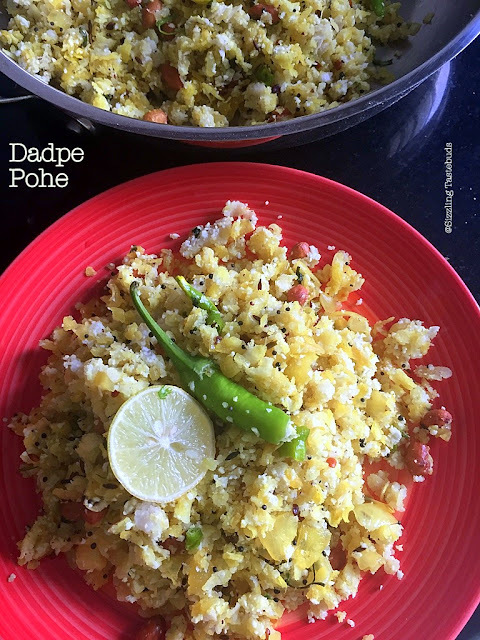 Thin Poha Chivda or Patal pohyacha chivda (Thin Poha Chivda) was on my to-do list the moment I decided it was going to be Maharashtrian Region featured this week on BM. However, it kept slipping my mind to buy Thin Poha every time I went to the grocery store. My elder one prefers to carry some light snacks along with some fruits for her short break so yesterday morning she asked me if there was chivda or Murukku (Chakli) to carry to school. And there it was : a great reminder to make them !! I made both of them. I have a Microwave version of Chivda (with Thick Poha) and a deep fried version too. But this version apparently made for Diwali by most Maharashtrian homes. 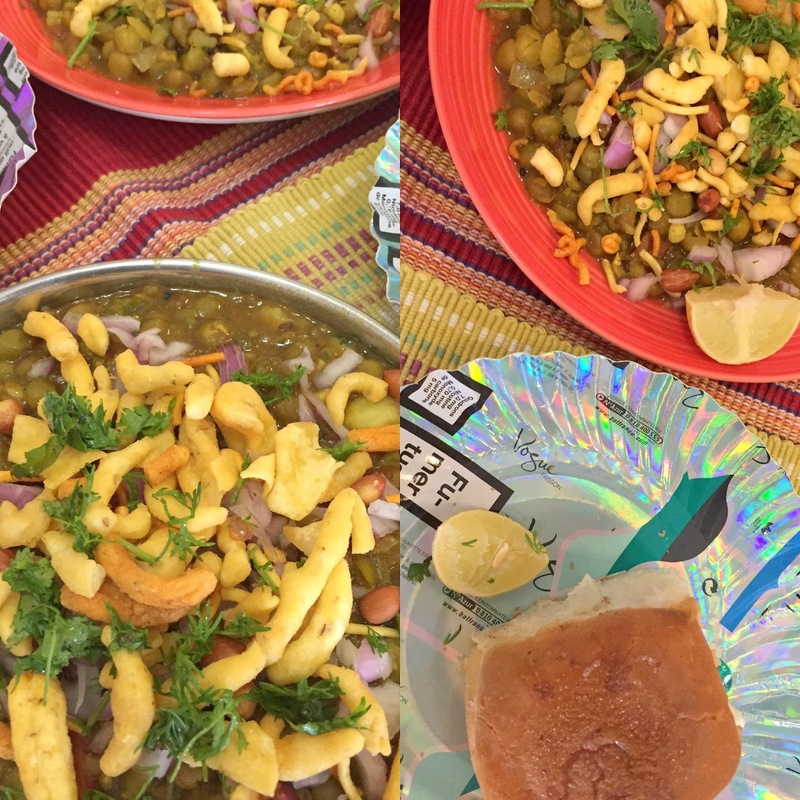 Hope you enjoyed this week's series with Healthy Missal Pav and Dhadpe Pohe. Garlic is also added to this, but I didnt have any and mom & me are not great fans of garlic, but if you love them, please do go ahead and add them. Dry roast coriander seeds in a pan, and pound them in a pestle-mortar to a coarse texture. In a pan, heat Oil, add all the temperings one by one. Add the crushed coriander and fry for 30 seconds to release aroma. If adding garlic, saute the garlic for 2-3 mins in oil before adding any other tempering till the raw smell disappears, and then proceed with above step. Once the peanuts roast well, turn off the stove. 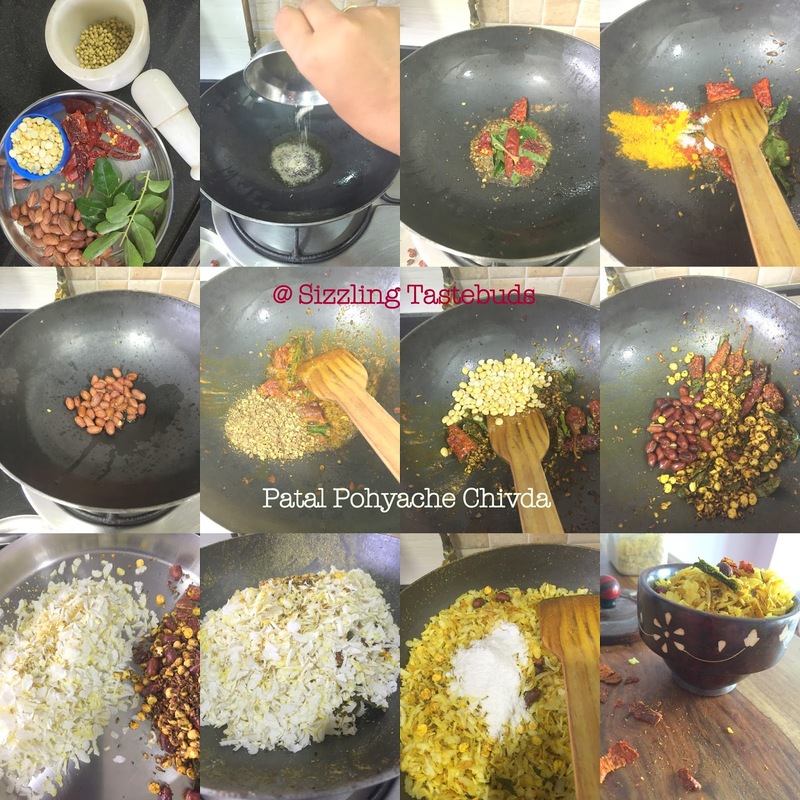 Add the thin poha in batches and mix thoroughly to ensure the tempering is uniformly mixed in. The poha should not be warmed at this stage else it will shrivel. Just ensure it turns warm and crispy. While still warm, add the powdered sugar and mix again. Store in airtight containers and serve. 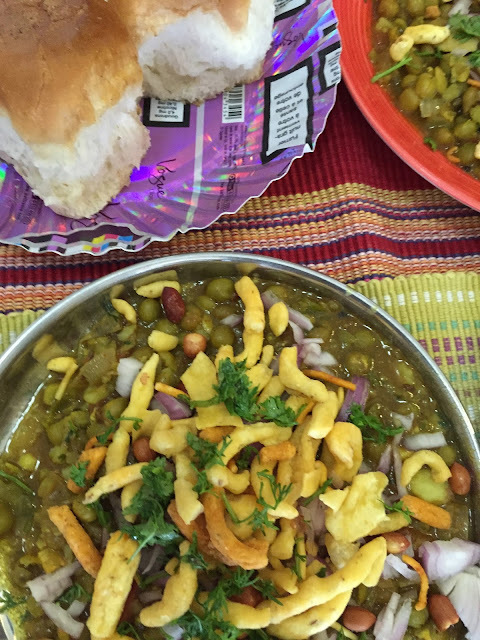 Missal Pav is another of my favourite snacks in Maharashtrian Cuisine. We usually make Moongachi Usal or Safed Vatanyacha Usal. Both Usal and Missal are served with Pav (bread roll) in most Zunkar Bhakri Kendras (roadside eateries) sprinkled across Maharashtra and is a very popular street food. 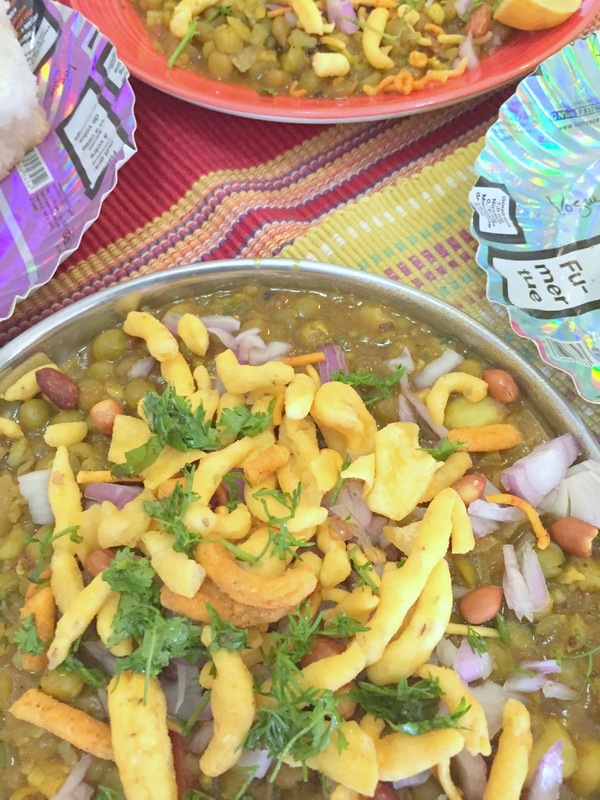 Today's dish with mixed lentils is a very filling snack and I got this from a neighbour friend and thankfully could record it in my recipe diary. Its mildly spicy and also has way less oil than the original dish sold in eateries, but there's absolutely no compromise in taste. Do give it a shot and let me know how you liked it. Sending this to my event + giveaway MonsoonMojo2 & also to MLLA #97 hosted on my blog. MLLA is a highly successful event managed by Lisa, and the brainchild of Susan. Soak the mixed lentils for 6-8 hours, drain the water and pressure cook for 6-7 mins with little salt till soft but not mushy. Drain the cooked water, and retain 1 cup of this water aside. Heat 1 TBSP oil, except dry coconut, fry all ingredients on very low flame one by one till fragrance comes out. Switch off, add the dry coconut and fry for 30 seconds. Cool in a flat plate and powder to a smooth powder. We shall be using only 1/2 of this powder for this recipe. In a deep bottomed pan (iron works best), heat oil. Add the shahjeera, onions, chopped green chillies, fry well. Add the ginger garlic paste and fry further till the raw smell disappears. Add half of the spice powder, and saute till the oil separates. Now add 1/2 cup water from the cooked lentils and add the salt. Let it simmer for 5-6 mins. Add the cooked lentils, Mashed potato and add the remaining lentil water and let it simmer slow for 7-8 mins. Serve hot ! This week, we shall see some treats for regional theme from Maharashtra. Having lived here for close to a decade and a half, our breakfast and snacks are no doubt influenced by the local cuisine. A melting pot like Mumbai offers virtually every cuisine there's out there, but Maharashtrian,Gujarati & Rajasthani meals are our family favourites. 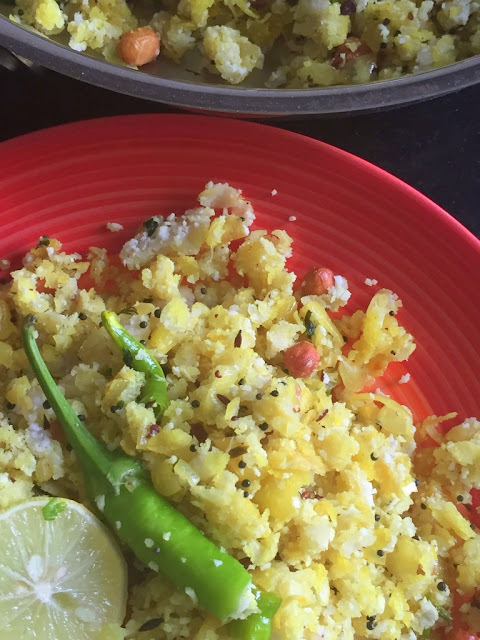 Yes, we do love our Idli / Dosa / Upma / Pongal for breakfast, but Poha stands out as a great choice for weekday breakfast or snacks. Such a versatile ingredient, there are umpteen dishes that can be made. Today's dish is a quick to make, yet utterly delicious Dadpe Pohe. 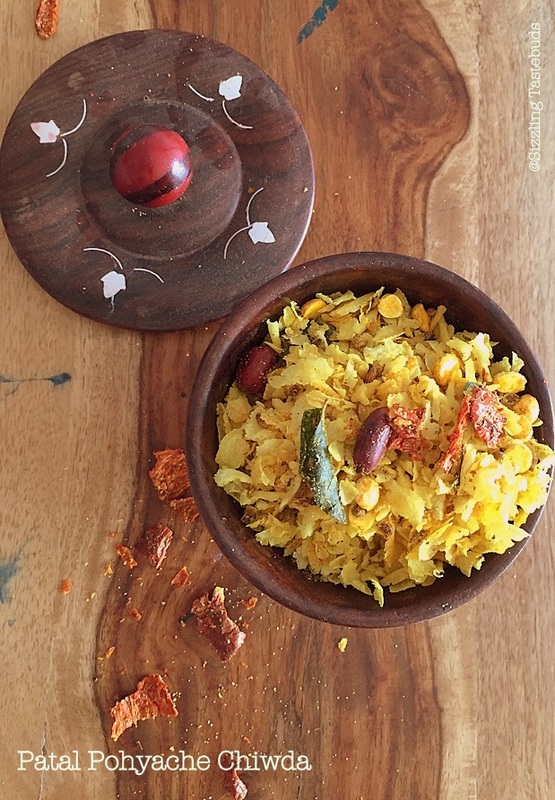 Almost (well, almost) no-cook makes this fuss free Poha a great snacks at 4pm to fill in between Lunch and Dinner. I know lots of families who prefer this for breakfast too ! Lets get to the recipe then. Adapted from here.. Grind the coconut with 3/4 cup water to a thick paste and keep aside. I added a handful of almonds & 1 green chillies for a spicier and nutty taste. In a pan, add oil. Splutter the mustard seeds, Jeera, add the turmeric, hing, curry leaves, green chillies, peanuts, and onions. Saute well till onions turn translucent. Add salt and mix well. 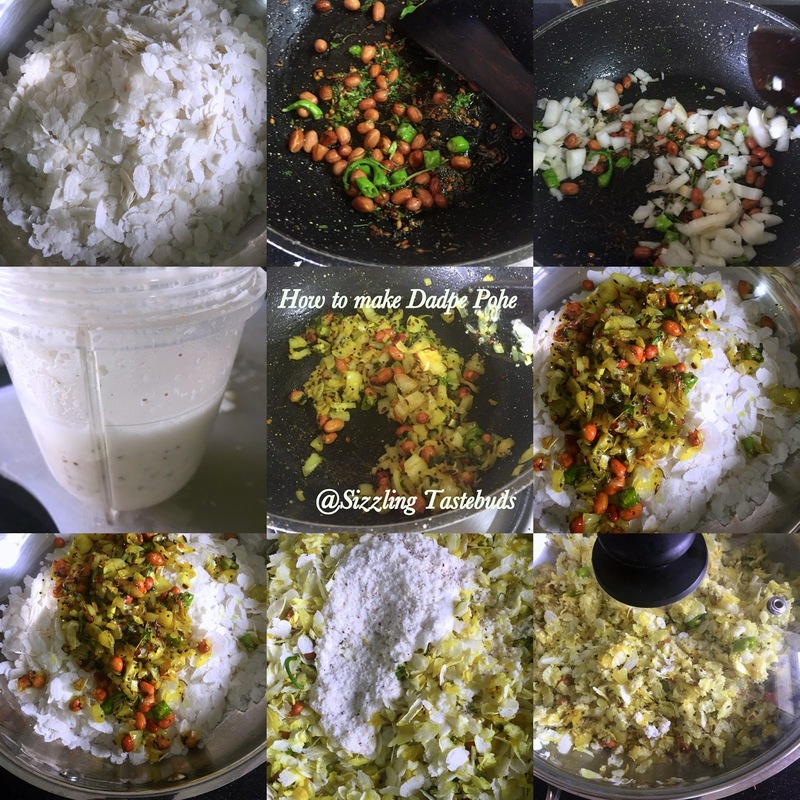 In a large bowl, add the thin Poha, add the sauteed onions, and mix well. Now add the ground coconut paste, lemon juice and mix well really well. Cover and keep aside for 15 mins. The flavours will be absorbed well into the poha. Check for salt and spices. Who doesnt like Ice Cream ?? I mean, who doesnt ?? well, save for a few, none ! I was pleasantly surprised to be given a hamper of two flavours of London Dairy Ice Cream this weekend for a product promo to celebrate National Ice Cream Day - #LDIceCreamDay . It sure did pep up a rather sullen, rain-swamped weekend with two lovely flavours - Praline Cream & Cookie Cream which the kids loved and this created #SpecialMoments with the Family. The kids couldnt wait for the photoshoot to be over and indulge in some creamy delight. And while the #Mostfavouriteflavour is Belgian Chocolate which unfortunately didn't figure in the hamper, the second best prize went to Praline & Cream. This month for Breadbakers, Mayuri chose natural sweeteners (like maple syrup, honey, blackstrap molasses, dates, banana puree, coconut sugar, balsamic glaze, brown sugar syrup, real fruit jam made without any sugar, stevia, palm jaggery). 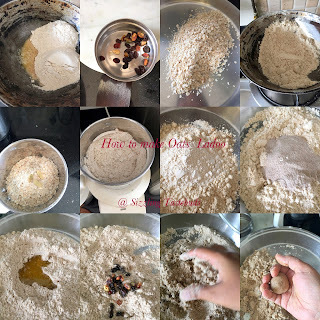 I was very keen to participate in this coz as a family, we have been pretty successful in cutting down refined products (both refined flour and sugar) in most of the cooking / baking at home, while even going sugar free for our everyday coffee / tea / mock tails. 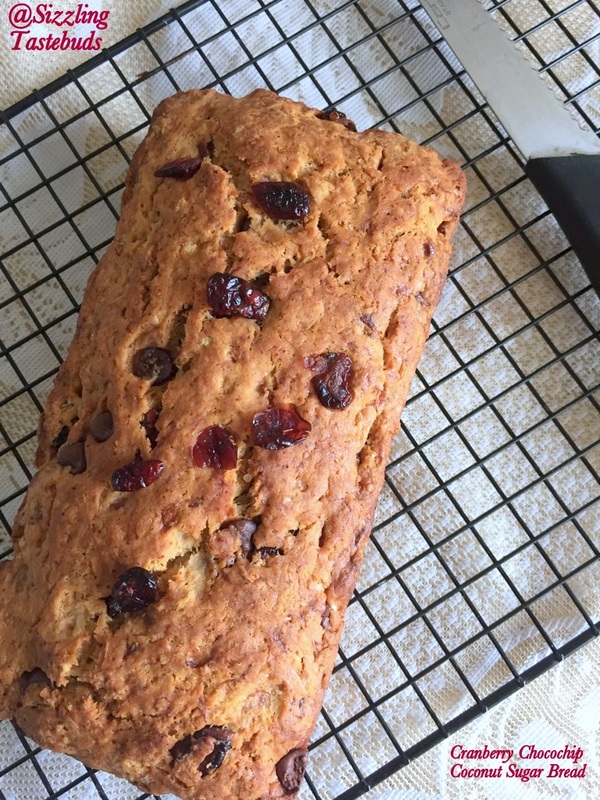 Natural sweeteners are such a delight to work with, and I was happy to use my batch of cranberries along with Coconut sugar that the husband so lovingly lugged back from NYC last month. It was the first ever bake with coconut sugar, and we loved the nuttiness that this sugar provided without adding guilt to the indulgence. The quick bread keeps well on the countertop for 2-3 days (if it lasts that long!) but I am pretty sure it freezes well. 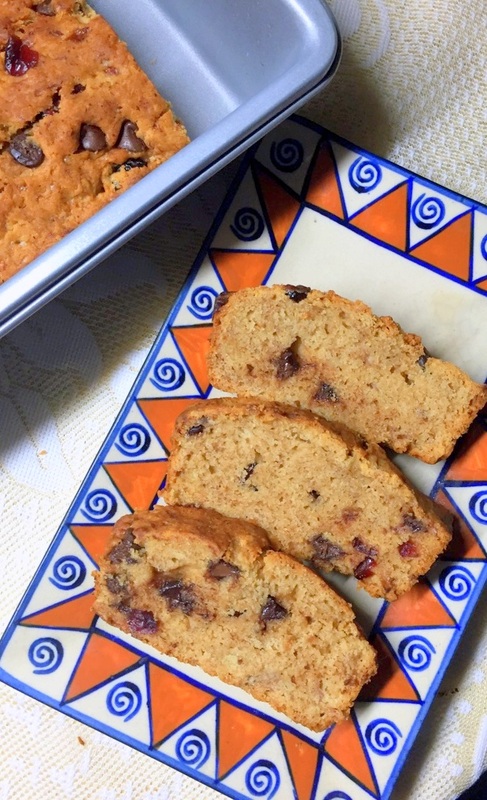 So, make this for a quick snack or take it along for potlucks. Either way its a winner. Sift all the dry ingredients twice over in a large bowl. Beat the oil, mashed banana and coconut sugar in another bowl till the sugar is melted, fold in the milk, applesauce, vanilla essence and mix once. 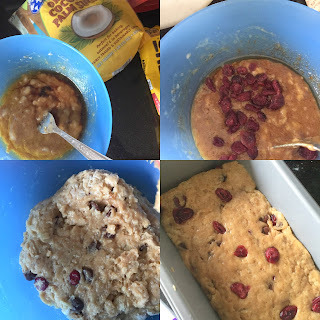 When there are no dry streaks of flour, pour into prepared loaf pan , top with remaining chocochips and bake for 40-45 mins till a toothpick comes clean from the centre of the pan. Rest in the pan for further 5-7 mins, then invert onto a wire rack. 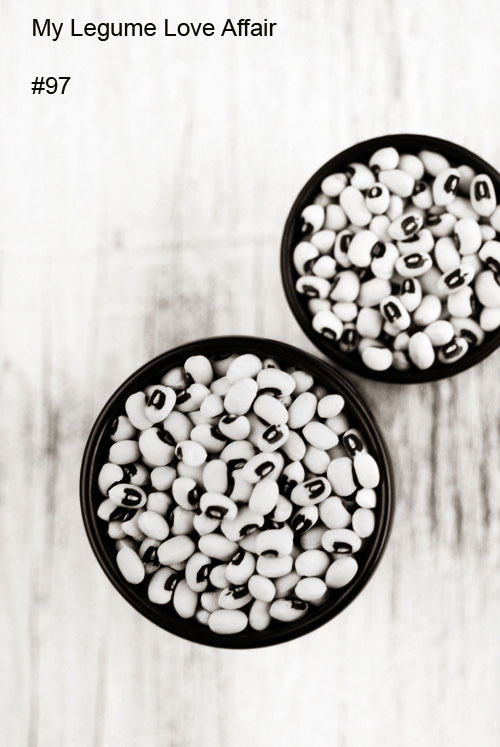 One of the key requirements for diabetics is increasing fibre along with reducing fat and sugar intake. Sometimes, the fibre comes from Oats which many people may not prefer in its natural state. 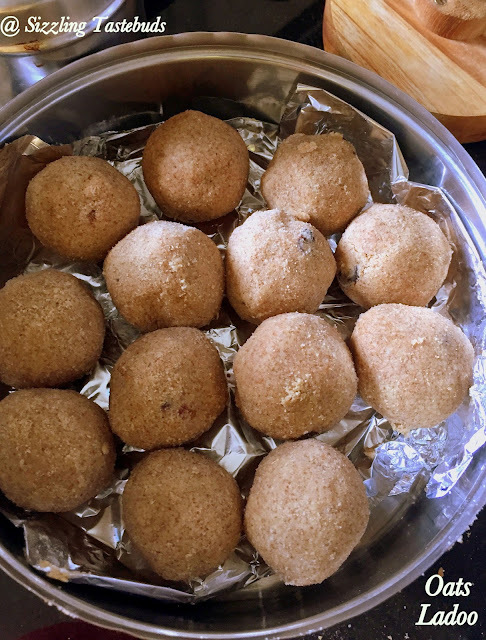 Kids too dont like Oats porridge (atleast my kids dont), so I make these Oats Ladoo for both diabetics and kids and its a winner. Trust you enjoyed the diabetic desserts this week with 2 -min Chocochip Mug Cake & Low Gajar Halwa with Jaggery. Dry roast Oats on very low flame for 3 mins till warm and turns slightly crispy. Roast the atta in 1 tsp ghee for 2 mins till slightly warm. Cool the Oats along with cardamom, powder it fine. Dont sieve it for it will lose its fibre content. In a bowl, add the atta, powdered oats and grated jaggery - mix them well with bare hands and let them sit for 5-7 mins. This will release some moisture from the jaggery and you will need less ghee to bind the ladoos - So this is an important step. Use only paagu vellam or dark coloured jaggery rather than dry yellow jaggery in this recipe. Meanwhile if using nuts, fry them in 1/2 tsp ghee and add to the above mixture. Melt ghee thoroughly and add to the oats-atta mixture. Mix and quickly take small-medium portions to make ladoos of required size. Its ok if the ladoos aren't smooth on the surface (If you wait for the ghee to cool down, then the atta-oats mixture needs more ghee). Once made, store in an airtight container (I didn't use any milk so it stayed on the countertop for 3-4 days in an airtight container). 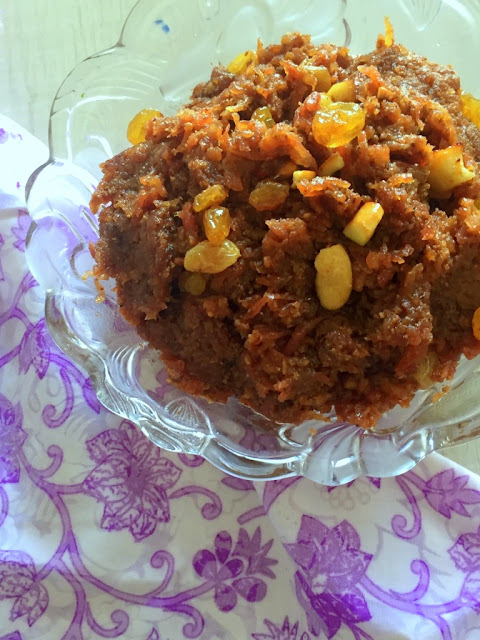 After Yesterday's 2 -min Chocochip Mug Cake, here's another twist to the all-time favourite Gajar Halwa. Made with Jaggery + Palm sugar instead of refined sugar. It tasted slightly different, but it was worth the twist. 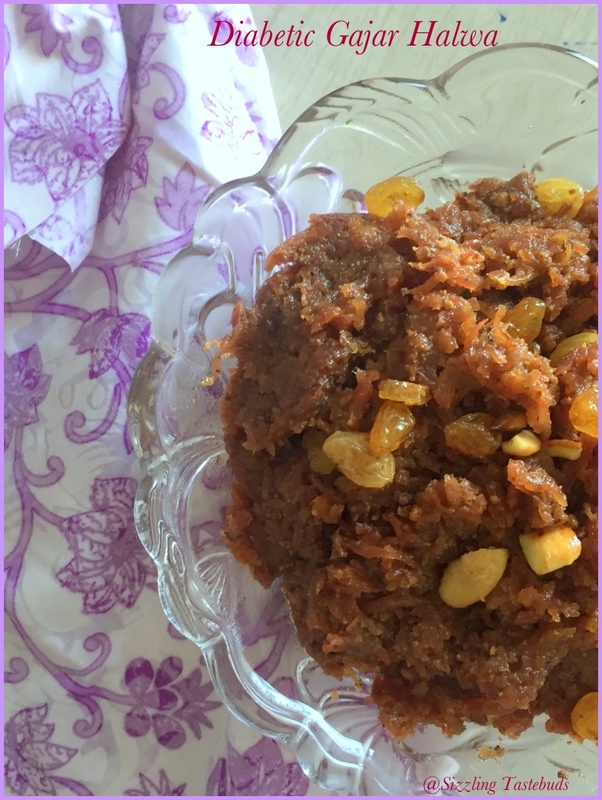 I had earlier made a low cal Gajar-Lauki Halwa (Carrot- bottlegourd Halwa) & I used the same proportion of veggies to further reduce the fat and carrot (sucrose) for diabetics. Whether you are diabetic or not, this twist with jaggery and more veggies is sure to be a treat. Wash, peel, grate Carrots and Lauki. Add a pinch of saffron and pressure cook with the milk for 4 whistles. Let the pressure come down fully. In a pan, heat ghee saute the nuts. Add the cooked veggies and saute for 5-6 min on low flame. 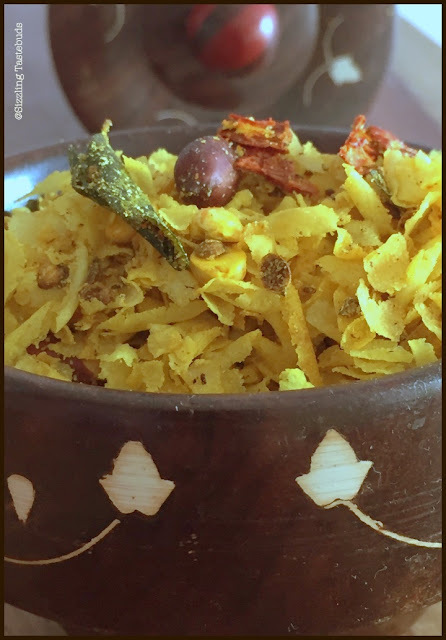 Add the grated jaggery, mawa if using, and let it cook till the mawa is melted and ghee leaves the sides. Add cardamom powder and mix well. Today's is a quick Microwave Choco chip mug cake that can cure those midnight sweet cravings. It takes lesser time to cook than to assemble the ingredients. 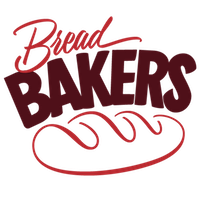 What’s more, the recipe can be easily doubled, tripled or even quadrupled as this is a single serve recipe. This week we are focussing on Desserts for Diabetics , where portion control, low cal & low fat substitutes can be easily made in place of original high sugar + high fat desserts. Here’s presenting 2 min Choco chip mug cake. Also sending this to my event + Giveaway Monsoon Mojo 2 . In a microwave proof mug / ramekin, Mix the dry ingredients – flour, Cocoa, soda, salt, sugar well. Now add the butter/ oil, milk and essence and mix and make it a flowing batter. Top with Choco chips and microwave at 600W for a min, then turn to highest power and microwave for 1 min. Rest for 15-20 secs and serve immediately. Hosting MLLA - Edition # 97 ! 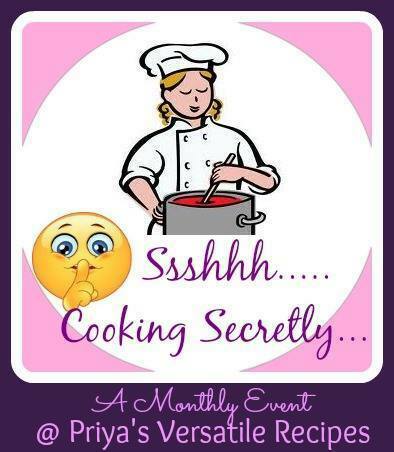 Seems like Deja Vu, but so happy to be hosting MLLA - edition # 97 all July here at Sizzling Tastebuds. I had hosted Edn. 91 also last December & also Edn. 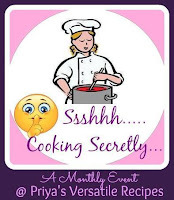 59 (in 2013)and Lisa, who's managing Susan's highly successful Blog Event - MLLA (aka My Legume Love Affair) was kind to give me another opportunity this year to host it again ! 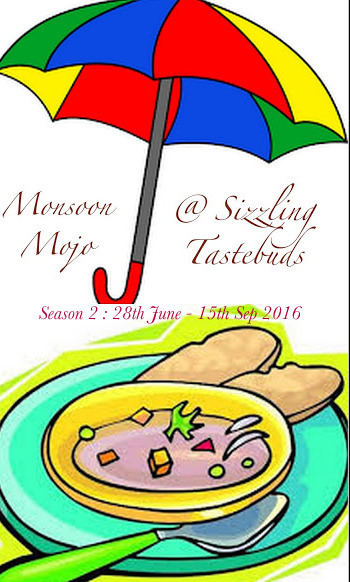 In case your entries also qualify to something you can enjoy during the rains, be sure to link back to my other event and Giveaway - Monsoon Mojo (season 2) where you can get a chance to win a giveaway ! Do use the Linky tool below to link up your Vegetarian / Vegan / Eggfree entries with LEGUME as the star ingredient. Any meat or non-veg dishes incl Alcohol based will be promptly deleted without notice. Look forward to all your entries.